It's shaping up to be a busy time here in Ottawa, with all sorts of Genre type events coming up, and, of course, we at Ottawa Horror want to keep you up to date on as many as we can. 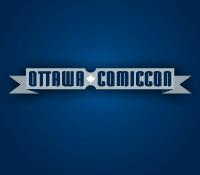 First, Ottawa Comicon tickets are on sale! The con will once again happen the weekend of May 10th to 12th, and already has a pretty cool line up including Firefly cast members, and Gillian Anderson of the X-Files amongst many others. Tickets are going fast, and they sold out last year, so don't delay. They'll be announcing more guests in the following weeks. 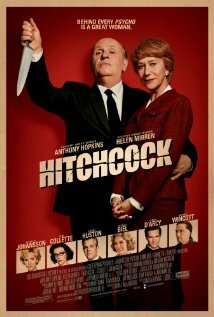 Then, on February 22nd, Ottawa Horror will be presenting the Premiere of "Hitchcock" at the Mayfair Theatre. We'll have more details, and some giveaways to come. The show will start at the shockingly sensible hour of 7pm. 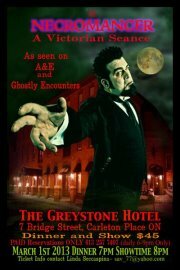 Finally, on March 1st, the one and only Nikolai Diablo and Carnival Diablo present "The Necromancer", a Victorian Seance , at the Greystone Hotel in Carleton Place. Nikolai and the crew always put on a show, and this one promises to be incredible. The dinner itself looks worth the price of admission.